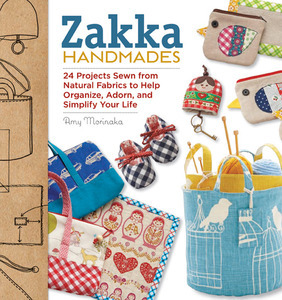 Learn how to sew simple, clever things that organize your home and help with daily tasks with Zakka Handmades! These incredibly useful projects include pouches and bags, small toys and baby items, and handy kitchen accessories. Some of the author’s sewn items also incorporate simple crochet. In Japanese, zakka means “household goods,” referring to items for domestic use—tableware, kitchenware, containers of various kinds, even simple clothing. What all the items have in common is a simple, fresh, handmade aesthetic; a subtle, clever wit; and absolute usefulness and practicality. Zakka is a Japenese term for the many small household goods that organize our homes and help us with daily tasks. Making these items yourself gives them a personal, meaningful touch that can't be bought. In this book, you will find more than twenty fun projects with illustrated instructions, patterns, and helpful tips. These easy-to-sew projects- pouches and bags, small toys and baby items, personal accessories and handy kitchen items-all share a simple, fresh, aesthetic, a subtle, clever wit, and absolute usefulness. Follow the directions to a tee, or design the items in styles to suit their recipients. Zakka is fun to make, fun to use and even more fun to share with others.